The first time I used this pen, I was immediately astonished by how quickly it moved across the page. This surprise came from the fact that when I took the pen out of its’ box, I held up the pen and realized that it had a quite comfortable heft but wondered if that heft might prevent me from being able to scribble as quickly as I wanted to. My doubts were proved wrong in the first minutes of use. This is a fine pen that performs very well under pressure. It produces dark, firm lines without gaps or spaces. There is much to recommend about the Delta Virtuosa Fountain pen. The Delta Virtuosa Fountain pen has an extraordinary grip. When I hold it, I feel as if my hand is being caressed by the pen. Writing with the pen is not a chore; instead, it feels as if the pen and my hand are one. There is a flow to this. When I guide the pen along the page, I feel as if I am running my hand through water. 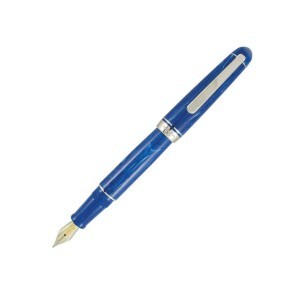 Therefore, the experience of writing is quite rapid and easy, not something all of the top fountain pens have on offer. The pen produces letters without stuttering and making ugly breaks and spacing errors. When I use this pen, I am able to write endlessly without feeling the need to slow down. I write quite lightly; so, it was nice to observe the pen producing nice dense lines even though I was not straining myself to press down incredibly hard on the paper. Also, I have noticed that this pen is quite gentle on the paper that it is used on. I have been able to write on quite fine paper without noticing any scratches or tears. Because this pen is able to do its’ job so well, I am able to focus on what I am writing completely. I do not have to think about whether or not the pen needs more ink. In fact, it is able to write without being re-filled for a very long time. I have noticed that when I do refill the pen, it does not take very much time at all. All I have to do is draw the ink out with the converter, and then put it back in the pen. The converter suctions ink out very quickly, and I do not spend too much time getting rid of air bubbles. This is great because it means that I have plenty of time to write. This is quite a pricey pen, and if you don’t have the budget for it, something a little cheaper which you may consider is the Waterman Hemisphere, another excellent pen. I think that the Delta Virtuosa Pen is an excellent fountain pen. The pen has a comfortable weight in my hand, which means that I do not have to spend time re-adjusting it and turning it around my fingers. It creates solid, deep lines on paper without much effort on my part. Finally, refilling the pen is very easy because the converter is so well-designed. I have had a wonderful time using the pen because of its’ convenient features and excellent design. Comes with the top recommendation of bestfountainpenshq.com!